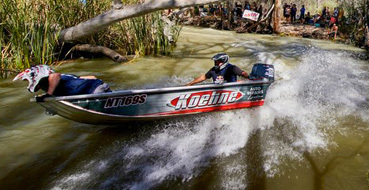 There's only one boat race in the world where two-man teams blast up southern Australia's Murray River in aluminum dinghies at speeds of over 80kph. The river is tight and full of dangerous obstacles, but that's the race's biggest drawcard! From the trailer, a Dinghy Derby racer might look like any other fishing dinghy. But upon closer inspection, it’s plain to see that a Dinghy Derby machine is far from your ordinary boat. .
For the modified classes, we buy a perfectly good Stacer, cut all of the seats out of it, pull the bottom apart, re-shape the flooring, strengthen it and then re-weld it all back in and go from there. The lighter the better. 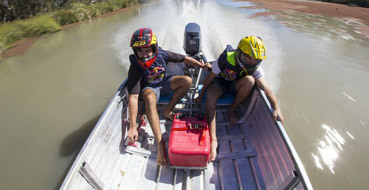 The 37th annual Red Bull Dinghy Derby delivered a weekend of raw, high-octane thrills along the mighty Murray River. What is it that makes these guys risk it all on the water?